Despite having fewer days in its first reported sales total, the annually issued Proof Set scored three-day sales of 196,034 for the best start since the one from 2015. A bonus Lincoln cent with the "W" mint mark of the West Point Mint comes with every set. It’s boosting sales. This bodes well for the upcoming 2019 Silver Proof Set and 2019 Uncirculated Mint Set as their orders will include their own unique "W" cent. Proof Sets over the years have launched in different months and on different days of the week — usually on Mondays, Tuesdays or Thursdays, affecting their first-reported totals. Keep that in mind when looking at the figures in the table below. *The 2018 Proof Set is still available, advancing in sales by 1,367 from a week ago. The Rocketship product launched with a solid start, logging four-day sales of 17,825 units. 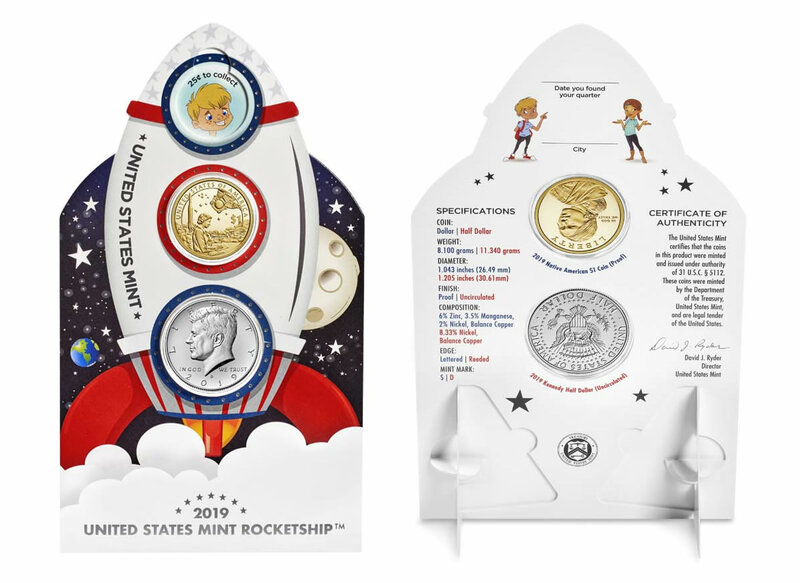 U.S. Mint images of the front and back of its “Rocketship” product. The card can stand-up via two easels. The only slightly comparable product to the 2019 Rocketship set is the still available Coin Discovery Set from 2014. It opened with four-day sales of 3,025 units and now stands at 11,449. In its latest report, the U.S. Mint published sales data for 115 numismatic products. Twenty-three products outperformed their prior weekly gains against 64 previously. Not counting the new products so as to compare apples to apples, 9 products increased by more than 1,000 units against 11 in the previous report. In addition, 2 products saw their sales reduced compared to 3 previously. The sold out 2019-S Proof Apollo 11 Half Dollar Set fell by 104 units to 98,912. Below are tables showing the latest sales for U.S. Mint numismatic products. The sales period covers from Feb. 25 to March 3. Products with an asterisk (*) are no longer available or had no reported sales. 2018w uncirculated currently unavailable is this the new king of low mintages at 137,306 excluding the 1995w ? 2018 is available & is after just CLAD…………..
2018w uncirculated american silver eagle for the second time this week is again currently unavailable. has anyone seen mike mezack selling the 2019 rocketship set with the PROOF LIKE kennedy uncirculated half dollar. i never heard of a proof like uncirculated coin anyone have any info on this ? Years ago the Canadian mint use the proof like term for their special packaged silver $ coins. I’ve seen it used elsewhere too. Since this set costs $9.95 from the mint, “mike” probably needs to spin his price of $99.95 for 2 sets (including one ‘proof like’ Kennedy). Was interesting when he said he bought “half” of the sets. The clad 2019 Kennedy half dollar coin in the Mint’s 2019 Rocketship set is officially called an “Enhanced Reverse Proof” finish by the Mint. It is not Prooflike per se. Mezack is just trying to hype a cheap clad coin with a mintage of 50,000 as he always does to sell it at an astronomical high price to unknowledgeable buyers on HSN. Thank you for the official name. It will be interesting to see the next week sales for this set (as noted mike said he bought half yet sales as of 3/3 were only 17825). Was hoping this might sell out as it might mean the young might develop an interest in coins but looks like only the “old” have an interest. Still have question about official name you cited as the description cites “uncirculated finish”. Nothing about proof for the Kennedy. Seth, You say the Kennedy in the Mint’s 2019 Rocketship set is officially called an “enhanced Reverse Proof” finish by the mint but I don’t believe that is the case. The Apollo 11 set has that title and that finish, but the Rocketship Kennedy coin is described by the mint as simply “uncirculated” with no other description that I can find anywhere. And believe me, I have looked, since I collect Kennedy halves with a passion. Did you mistakenly type “Rocketship” in the above post, or did I miss something about the finish on the Rocketship set? Also please note, in looking at the certificate on the back of the Rocketship set that I got, it just says “uncirculated”. Please see my other comments about this coin in response to Gary (and before I saw your comment). I am still waiting for my five (5) Apollo 11 5 OZ coins also, Seth. The Kennedy half dollar in the Rocketship set is just a regular Unc. finish 2019-D coin. I don’t have the sets at home anymore as I put them up in safekeeping with all my Apollo 11 coins & was thinking of the upcoming free Enhanced Reverse Proof Lincoln cent that has been on my mind recently. Sorry about that! Thank you for your replies. I, also, am surprised the gold and 5 oz Apollo coins have not sold out but likely some did not want to wait so long to get them. Imho, the mint personnel really screwed up on this and even worse are not forthcoming with us. 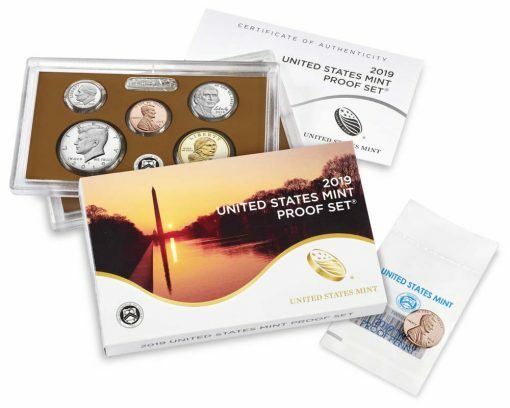 As for Mike “Sold Out, Limited Edition” Mezack–On HSN he’s hyping that he’s “giving away” the Proof Set with the “W” Proof penny in ANACS in PF69 for $99.99. For crying out loud, you can have the Proof Set and the “W” Proof penny for $27.95. Mike Mezack is the coin collecting “god” Repeat Repeat Repeat!!! I finally received an email today that my five (5) Apollo 11 5 oz coins have shipped. The US Mint should be concerned about all of the Back Order coins that will be returned. The US Mint messed up. The quiet after the storm, will cause an enormous cancellation of the Back Ordered 5 oz coins. If the production number was 50,000, they would have Sold Out. As of March 10 sales of the 2019 Rocket Set are 46,726 and currently unavailable. I purchased two of the Rocketship Sets. Mike “old Out, Limited Edition” Mezak was hawking them like they were gold. I posted a correction on that in a new post here 2 days ago to Chuck. It also looks like the US Mint website is down this (3/13/2019) morning. The site is back up again. Funny how the site being down coincided with an email I received from the Mint that the Apollo 11 “Engraved Prints” were available again, but not for long.